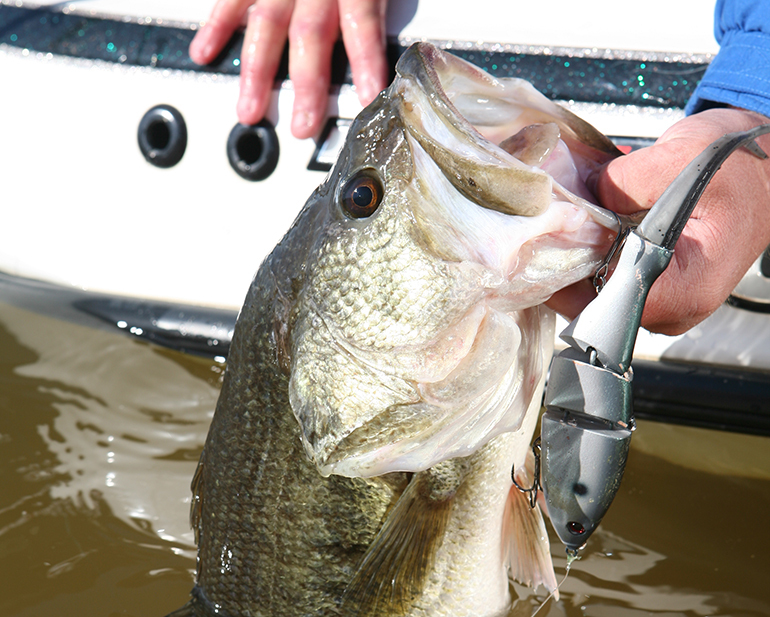 Everywhere In Louisiana, awesome bass fishing is just a short drive away. Largemouth bass is the premier freshwater gamefish for a high percentage of Louisiana anglers. Largemouth bass, the premier freshwater gamefish for a high percentage of Louisiana anglers, begin spawning as water temperatures rise into the 60s. In preparation for the spawn, they consume bait fish, crawfish, ducklings and basically anything else they can fit into their mouths. No wonder spring is the favorite time of year to crank up a bass boat. Here is a district-by-district sampling of how the state’s bass fishing forecast stacks up this year. The northwestern portion of the state is home to both rolling hills and flat river valleys that form attractive lakes and rivers. As a result, bass fishing has become a popular year-round activity. Caddo Lake, which is a shared waterbody with Texas, features public access via the Mooringsport Ramp and the Earl. G. Williamson Park ramp. Both Texas and Louisiana have stocked the lake with bass fingerlings over the years. Plentiful habitat and consistent water quality helps keep Caddo a highly productive bass fishery. Representing the city’s of Shreveport’s water supply, Cross Lake is found just west of the city. Anglers can cast bait from the public fishing pier hoping to catch spawning bass in the spring. Once the spawn wraps up, deep diving crankbaits or weighted worms may do the trick. Habitat varies across the lake. Standing cypress and natural cover on the west end of the lake gives way to a large expanse of open water and man-made cover on the east end of the lake. Fishing along the northern or southern banks, both of which are covered with manmade structures, proves fruitful right through autumn. Caney Lake is located in the extreme eastern portion of District I, nearly centered along the midline of the state. The impoundment was created in 1986 after several creeks were dammed. Caney is a rock-solid lake and is filled with clean, clear water. In fact, in the record books (maintained by the Louisiana Outdoor Writers Association) show that six of the top 10 spots are filled with Caney Lake bass. Caney has fast become a bass fishing magnet for anglers in the northern third of the state. The fishing is as good in March as it is in October. The fish stock’s hearty genetics, the lake’s quality habitat and clean water, and the stability of the system keeps Caney in bass forecast for another year. It’s not the only lake worth a look in the district, however. “Ivan Lake is an out of the way gem that sees has very little pressure, historically, though I believe that is changing now that the word is out,” Sibley said. He is referring to a small impoundment along the west side of Bodcau WMA. The lake has been around for a while, since the 1950s, in fact, and was managed by the Police Jury until the 2000s. Five public fishing piers and a boat launch make this accessible to bank fisherman and boaters alike. Interestingly, the lake was dewatered unintentionally back in the early 2000 and was left dry from 2007-2012 while repairs and maintenance of the lake bottom were conducted. The lake was stocked in 2013 with thousands of adult and juvenile game fish and bait fish. It appears that the game fish, especially the largemouth bass, are ripe for the picking. One of Louisiana’s naturally formed lakes, Bistineau, is located in portions of Webster, Bossier, and Bienville. Bistineau has, in many ways, been the epicenter of the LDWF perennial battle with giant salvinia. “Drawdowns in Binstineau are used to control vegetation — mainly giant salvinia,” said Sibley. The presence of the invasive salvinia is one of several factors leading to habitat degradation and decreased recreational opportunities for anglers and other recreation seekers. In addition, overgrowth of the invasive plant lead to decreased water quality and threatens the stability of native aquatic communities. In Louisiana, salvinia is considered an established invasive species and, according to the LDWF, it is capable of doubling in biomass in 3-5 days and has the potential to double surface coverage every 7-10 days during optimum growing conditions. Biologist District Manager Ryan Daniel maintains two identities; if he is not monitoring bass populations on state time, then he is doing his part to catch them on the weekends. Using survey data, Daniel believes that a perennial favorite among bass anglers, Lake D’Arbonne, will continue to support a healthy bass population. “Nice fish showed up in our nets during our 2017 sample efforts and a good crop of 4- to 6-pound bass should be ripe for the picking this year,” Daniel said. In conjunction with high numbers of bass, there is always an opportunity to land larger bass. Quality nursery habitat gives bass a head start in the fish-eat-fish food web in which they live, and it’s that head start that makes d’Arbonne a good place to fish in the spring. As good as some of the lakes are in this district, there are other top options for bass anglers who enjoy river fishing. One of Daniel’s personal favorites bass hotspots, in fact, is the Ouachita River. “The River has been good over the years and flooding has helped the river bass. There are plenty of them. Last year’s prolonged drawdown didn’t hurt anything as far as the bass population is concerned,” he said. The Ouachita plays host to several bass tournaments a year, including one of Louisiana’s largest, the Ronald McDonald House Ouachita River Big Bass Tournament. Another type of bass fishing location to consider are small, off-the-wall places, the kind of bass havens that receive little pressure, and tend to be left out of many bass forecasts. For example, good spawns in 2016 and 2017 have produced hearty stocks of bass in Bayou Macon Cutoff lakes One, Two, and Three. “Bayou Macon flooded the cutoffs yearly and we could start seeing the results of the spawns this year,” Daniel said. The lakes are impounded oxbows of Bayou Macon. The lakes have similar physical features, fisheries, and management issues. The lakes are numbered in order from south to north. Cutoff 1 is commonly referred to as Liles Cutoff while Cutoffs 2 and 3 are known as “Crockett Point” and “Baker’s Cutoff,” respectively. Each lake is accessible to the via boat ramp, though a fee is required at Crockett Point. Though North Louisiana is home to many of the state’s most popular bass fishing destinations, anglers can find many good, if less famous, bass waters in central Louisiana as well. Shelby Richard is the LDWF biologist who oversees management of the lakes and rivers in District III. Richard expects good fishing in several of his lakes, including Lake Concordia. Baits like frogs or lizards do well during the spawn, since bedding bass are triggered to attack predators as they hover over a nest site. Expect nothing less than great fishing during the 2019 fishing year. Concordia is located in Concordia Parish and features several access points including the Old LDWF District 4 Office ramp as well as several private ramps. Little River is a tributary of the Ouachita and is formed near Georgetown by the confluences of the Dugdemona River and Castor Creek. For anglers, this means managers are not monitoring spawns, the big bass are there and ready for the picking. There are dozens of lakes and rivers in Louisiana, and it is not a stretch to assume that all of them contain largemouth bass in some form or fashion. Whether you are looking for sheer numbers or double digit lunkers, bass are plentiful in our state. You can bet that you can be landing bass as soon as the engine hits the water.